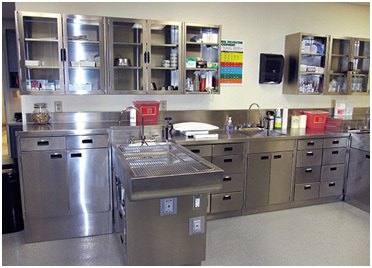 What’s the best time to time to plan your veterinary equipment for a new practice or a renovation? Much earlier than you think. Our team has helped hundreds of practice owners work with architects and contractors — and “waiting too long” is their #1 frustration. That’s because they ended having to compromise on their equipment choices because they procrastinated without knowing it would be an issue. We hate to see you miss out on the very best equipment with modern luxuries that will make your daily work life easier, for many years to come. That’s why we advise that you plan on selecting and specifying your veterinary equipment and supplies about three months before you need it. Here’s why. Unfortunately, we often get call from veterinarians who had thought about building the new facility or expansion, but waited to specify equipment such as wet tables, kennels, cages, wall-mount tables,dog grooming tubs, work islands and other critical equipment. All of a sudden, their contractors would say, “We need you to order that equipment right now.” Then, when the veterinarians get ready to choose the perfect equipment, they discover that it won’t fit in the new facility or space in time for the contractors’ schedule. Then they have to a) compromise with something that might work but isn’t perfect… b) request custom sizes that are more expensive, or c) worse, rely on their contractors make something out of wood laminate, which just won’t last. To help you avoid this frustration, call us for assistance with equipment decisions at the point of drawing up your architectural plans. We also can collaborate with your architect or builder as part of your project team. This will ensure that you’ll have a plan that meets your vision.